The 15th All Asian Inter-Varsity Debate Tournament was an unprecedented event by all means. Not only was it the first time that Bangladesh was hosting the tournament, it was also making its first appearance in South Asia, all the previous events being hosted primarily in South-East Asia and once in South Korea. It was also the first 'Asians' (as the tournament is commonly known) to be inaugurated by the Head of the Government of the host country, which shows the magnitude of the event. Being termed as the biggest international youth congress in the history of Bangladesh with more than 450 participants, the Asians, hosted by North South University Debating Club (NSUDC) was a huge success story in more ways than one. But before moving onto the tournament details, it would be really unjust to the organizers if the tournament's bidding history is not mentioned. As expected, the 'Asians' did not come to Bangladesh in one day but had a long and grueling history of its own. The first time North South University (NSU) sent their team to the Asians was in the year 2005. Both in 2005 and in 2006, the team from NSU narrowly missed 'breaking' into the top 16 being ranked as 18th and 17th respectively. The first bid was placed in 2006 by NSUDC President (2005-2006) Khondker Zunaed Rabbani, General Secretary (2005-2006) Sarajit Baral and General Secretary (2004-2005) Asif Newaz. Due to the extreme difficulty of holding this event, a year ahead of the next competition, bids are presented from different institutions who would like to host the All Asians and delegates from each participating institutions vote for the bid they believe will be best. Although NSUDC lost the bid in 2006 to South Korea in 2006, the team was able to create substantial impression. And for the next one year, the organizers made it a point to visit different debating events all across Asia to convince teams to vote for NSU and Bangladesh. According to Zunaed Rabbani, the convener of the event, he even had to answer some really silly questions based on people's preconceived ideas about Bangladesh. 'Do tigers roam around in the streets in Bangladesh? ', 'Do you have highways in Dhaka?' and questions of the sort. Overcoming all these obstacles, NSUDC managed to win the bid for 2008 in the Asians held at South Korea in 2007 and thus achieved a milestone for both itself and the country. The event started with foreign delegates starting to arrive in Dhaka from May 6, 2008 who received accommodation in the Pan Pacific Sonargaon Hotel. Registration began on May 7, 2008 after which, the Ice Breaking Party was held at the Samarai Convention Centre where the participants were thoroughly entertained by 'Nemesis'. 66 teams from 38 institutions hailing from 12 different Asian nations took part in the championship. 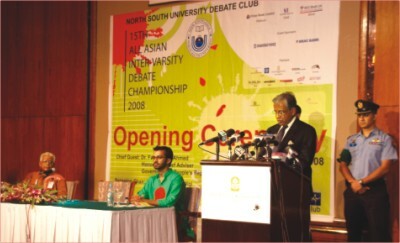 The tournament was officially inaugurated by Dr. Fakhruddin Ahmed, honourable Chief Adviser, Government of the Peoples' Republic of Bangladesh, on May 8, 2008 at the Grand Ballroom of the Pan Pacific Sonargaon Hotel. Dr. Fakhruddin Ahmed, in his speech, welcomed the foreign delegates to the beautiful Bangladesh. He invited them to explore the country, to discover its beauty and nature. He congratulated North South University for its excellent effort and for giving Bangladesh such positive exposure and for being the pioneer; he said cultural exchange, leadership building, fostering friendship lead to regional peace. Furthermore, he encouraged the youths of Bangladesh to host more such international events in the future. thanked everyone responsible for this event including the Board of Governors of NSU, the Vice Chancellor, the Tournament Advisory Committee, the Faculty Advisor, organizing committee and the sponsors. Following the convener, Dr. Hafiz G. A. Siddiqi, Vice Chancellor of North South University, also said a few words. He congratulated NSUDC for organizing a program of this magnitude and elaborated the success stories of the club in the debate arena both locally and internationally. This was followed by a cultural program performed by Shangskritik Shanghatan of North South University. Later in the evening, an exclusive fashion show, sponsored by Farzana Shakil Makeover Salon Ltd., displaying fashion of Bangalis throughout the different ages was held. Traditionally, the 'Cultural Night' starts after the Opening Ceremony is held so that the different nations of Asia get an opportunity to display their unique cultures. Delegates were all dressed in their individual country's attire. From 9th May, different rounds of debates started at North South University. The day ended at Hotel Regency where the Youth Development Night, sponsored by BRAC Bank Ltd. was held. This night was intended to increase youth awareness regarding various political, environmental, social and other global issues. On the second day (May 10), debates were also held at North South University. The participants were treated to a 'Fun Night' at the Wonderland Amusement Park later on the day, sponsored by Mojo. Here the participants got the opportunity to experience the ambience of a rural 'fair' with 'putul naach', 'shaaper khela', 'banor nach', 'nagardola', 'baul songs' and were introduced to the symbol of Bangali tradition, the 'gamchha'. The participants also enjoyed free rides in the park. On 11th May, the third day of the competition, the participants were taken to St. Joseph Higher Secondary School and College where the day's rounds of debates were held. The day ended at Pan Pacific Sonargaon hotel where after dinner, the Chief Adjudicator, Sarajit Baral of NSU, along with the Tab (the software used to determine the opponents for a given team) Director, Dr. Alfred C. Snider from Vermont, U.S.A. and the Deputy Chief Adjudicators, Mr. Jason Jarvis from South Korea, Mr. Siddharth Chauhan and Ms. Adiba Shareen from India, announced the names of the teams proceeding to the 'Quarter Finals'. A council meeting was held at the United International University (UIU) on May 12 where the organizers of Asians received a lot of positive feedback from representatives of different institutions. Chutinan Chutima of Thailand said, 'I have been to 3 Asians before and this is, by far, the best one'. The participants were taken to the Mojo factory afterwards where they spent the day enjoying cricket matches, flying kites, cycling among other things. They were then brought back to UIU where the Quarter Finals were held. Four teams proceeded to the Semi Finals - three teams from National Law School of Bangalore(NLS-B), India, and one team from the Lahore University of Management and Sciences(LUMS). The day ended at the Pan Pacific where the 'Championship Dinner', an elegant black-and-white-ball, co-sponsored by Rahimafrooz, took place. The night began with an enjoyable 'Public Speaking' round where a number of participants were asked to speak spontaneously on a certain topic. The night also included a session of free makeovers, sponsored by Farzana Shakil Makeover Salon Ltd. Bangladeshi Cultural makeovers were done on 11 lucky foreign participants of the tournament. They were dressed in all sorts of pure Bangladeshi attire, starting from Jamdani sarees to sarees with 'block designs' to Benarasi sarees and of course Panjabis. Following this, the organizers of the tournament entertained the participants with a fashion show of their own, also sponsored by Farzana Shakil Makeover Salon Ltd. The night ended with a performance by 'Black'. The Semi Finals of Asians was held at UIU on 13th May. Two teams from National Law School proceeded to the Grand Finale, also held on May 13, 2008 at the Plenary Hall of the Bangladesh-China Friendship Conference Centre. The final debate was chaired by the Deputy Convener, Asif Newaz, and was live telecasted by ATN Bangla. Following the debate, the Closing Ceremony started where the adjudicators of the different countries gave speeches praising the hospitality and warmth they received and the efficiency with which the 15th All Asians 2008 was held, thanks to the members of the NSUDC. The Convener, the Faculty Advisor of NSU Debate Club, Ms. Nusrat Sharmin Huq, the Chair-person of NSU Foundation, Ms. Rehana Rahman, and the Vice Chancellor of NSU, Dr. Hafiz G. A. Siddiqi also spoke on the occasion. Dr. Siddiqi congratulated NSU Debate Club for organizing such a successful tournament and the participants for being such wonderful guests. The tournament was officially closed by Dr. Hossain Zillur Rahman, Adviser, Ministry of Education and Commerce, Government of the Peoples' Republic of Bangladesh. The results were then announced by Sarajit Baral, chief adjudicator, while crests were handed out to the winners by Dr. Hossain Zillur Rahman and Dr. Hafiz G. A. Siddiqi. The title of 'Champion - 15th All Asians 2008' was taken by National Law School, Bangalore (1) while National Law School, Bangalore (3) took the 2nd place. Additional awards were given to Mr. Rahul Talwar from Symbiosis Law College, Pune, India, as the best Public Speaker; NorthEast University from China became the winner of the EFL round and Madame Piyanart from Chulalongkorn University of Thailand was adjudged to be the Best Adjudicator. Best Speaker of the Final was Mr. Yaman from the winning team of NLS,B (1). 4.TH supports the privatization of all energy production and distribution. 5.TH advocates human colonization of outer space. 6.THW restrict research and development of artificial intelligence. 7.THBT humanity will not reach the 22nd Century. 8.THW allow both men and women to have multiple spouses. 9.TH prefers need based higher education scholarships to affirmative action in admissions. Collaborating with North South University, throughout the tournament, were Prime Bank Ltd (Platinum Sponsor), Southeast Bank Ltd (Gold Sponsor), NCC Bank Ltd(Silver Sponsor), BRAC Bank Ltd and Rahimafrooz (Event Sponsors), Mojo, Citibank N.A., International Organization for Migration (IOM), ACI Ltd., Berger Bangladesh Ltd., Biman Bangladesh Airlines, Pan Pacific Sonargaon Hotel, United International University, St. Joseph Higher Secondary School and College, Farzana Shakil Makeover Salon Ltd, The Daily Star, Prothom Alo, ATN Bangla, Radio Foorti, Masthead PR and Computer Source Ltd.
Several schools in Dhaka helped by providing student volunteers for the event. St. Joseph Higher Secondary School, SFX Greenherald, Intl Turkish Hope School, Maple Leaf Intl School, European Standard School (ESS) and Oxford Intl School came forward for the purpose. The event wouldn't have been as successful as it was without the hard work and sleepless nights of the organizers and the volunteers. Some of the names worth mentioning include Khondker Zunaed Rabbani (Convener, NSU All Asians), Asif Newaz(Deputy Convener), Afreen Hossain Borsha (Tournament Director), Eeman Ahmed (Communications Director) among others. All in all, the 15th All Asian Inter-Varsity Debate Tournament was an extremely successful event and it should pave way for more such international events in Bangladesh in the future. Youth Congress Events lead to global peace and it is high time that our country starts playing its part in this regard. The big show, the 15th All Asian Intervarsity Debate, hosted by North South University (NSU), has ended. It was a gala of high quality and spirited parliamentary style debate, participated by 450 participants from a dozen countries. There was no major mishap or any tongue-biting faux pas. For a seminal event like this with logistical nightmare and organizational blunders waiting to emerge, it was actually quite smooth and well run. The debaters stayed at Pan Pacific Sonargaon Hotel, a significant event partner among a slew of such renowned helpful organizations. Thanks to the generosity of the hotel administration and the management acumen of the young NSU student organizers, they received the 5-star VIP treatment, both metaphorically and literally. Bangladeshi debaters were also offered the option to reside at the same hotel. Many availed of the opportunity of a weeklong fun, frill, frolic, fraternity and fellowship, with the all important debate as the focus, and national honor and institutional standing at stake. But the event almost never took place. After the successful bid to organize the contest for the first time in Bangladesh as well as South Asia, NSU administration was having a second thought about the financial backing and managerial structure and ability to hold the pioneering event. The serious reservations prompted the contemplation to withdraw the bid. On any inkling of doubts and trepidation, the diehard and persistent current and former members of the NSU Debate Club sprang into action with resolute 'can do' and 'never give up ' stance and attitude . They convinced the NSU Board and the Vice Chancellor that withdrawing the offer to host the momentous event would be a great discredit and stigma for NSU and a near major national disaster and disgrace. NSU Foundation and the VC were persuaded. Both pledged and offered unqualified support and assistance. The organizers and volunteers arranged the hotel and venues and persuaded the media partners; swayed banks, financial institutions and reputable firms to offer generous financial sponsorship; and the hardest of all, arranged assistance from governmental agencies to make it pleasant, convenient and user friendly for international participants to travel and spend a memorable week in Bangladesh. The office of the NSU Vice Chancellor was churning out request letters incessantly in an assembly line fast pace with the VC signing scores of such letters. At times the ceaseless student plea for help, letters, phone calls and requests got to be a bit much. On at least two occasions, the persistent, assertive and pervasive members of the debate club were thrown out of the office when their pushy request resembled a demand or a dictate. But they kept coming back wave after wave, offering genuine apology, and with the ultimate goal and big picture in mind. And it all worked out in the end. 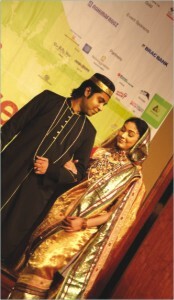 The Chief Advisor inaugurated the event at Hotel Sonargaon on May 8. Enthusiastic and expectant participants from all over Asia, decked out in vivid and bright national outfit and formal attire; diverse ethnicity and cultures, civilizations and traditions all under one roof for an eminent event. Dr. Hafiz G.A. Siddiqi, NSU Vice Chancellor, mentioned the Lincoln-Douglas debates, resulting in the victory of Abraham Lincoln as the US President that led to abolition of slavery and emancipation, to imply how debate can set the course of history. Days of knockout and round robin competition yielded 8 quarter finalists, a team each from Sri Lanka, Pakistan and Bangladesh and the other five from big behemoth talent studded India. NSU was not eligible to participate because of rules regarding possible conflict of interest. The Bangladesh prospect for greater glory rested with the IBA team of Ridwan, Sohara and Kibria. Then something unforeseen and unfortunate happened. Ridwan lost his voice prior to the semifinals. All day of drinking hot tea with lemon and honey, different voice enhancing maneuvers were only partially successful and the team lost against an Indian squad. The Semis had Pakistani LUMS and three Indian sides and the finals were an all Indian affair. Dr. Hossain Zillur Rahman, Education and Commerce Adviser, gave away the awards as the Chief Guest at the closing ceremony on May 13, 2008 at the Bangladesh-China Friendship Conference Center. This was a very successful Asian Intervarsity Debate tournament. Many individuals and organizations cooperated and worked collectively to make it an inspiring achievement. The guidance of the faculty advisor, Nusrat, was pivotal. But ultimately, the infectious energy, unbridled enthusiasm, concerted efforts and indomitable spirit of NSU Debate Club Members, such as Barsha, Diba, Nayeem, Mahmud and Shatadru and many others, who stubbornly believed in "Life isn't about how to survive the storm, but how to dance in the rain" made it happen.